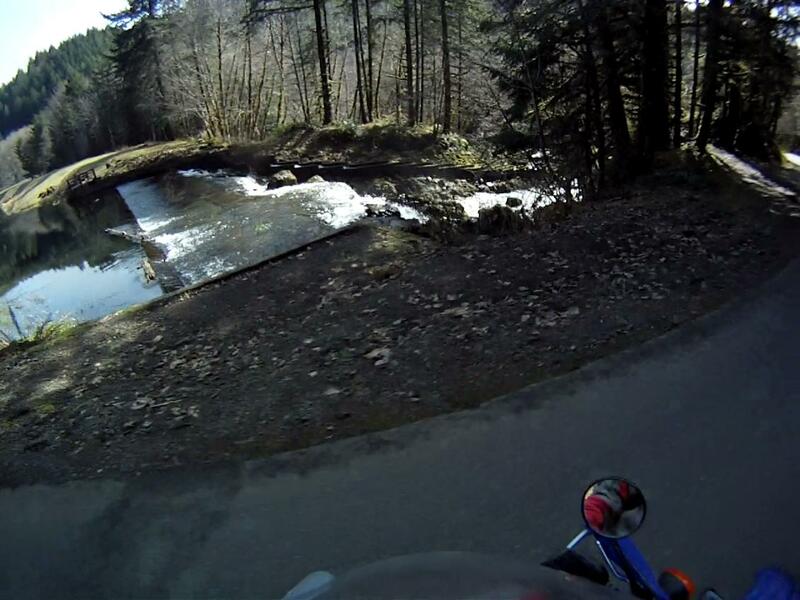 Finally I can report here the first ride of the year. 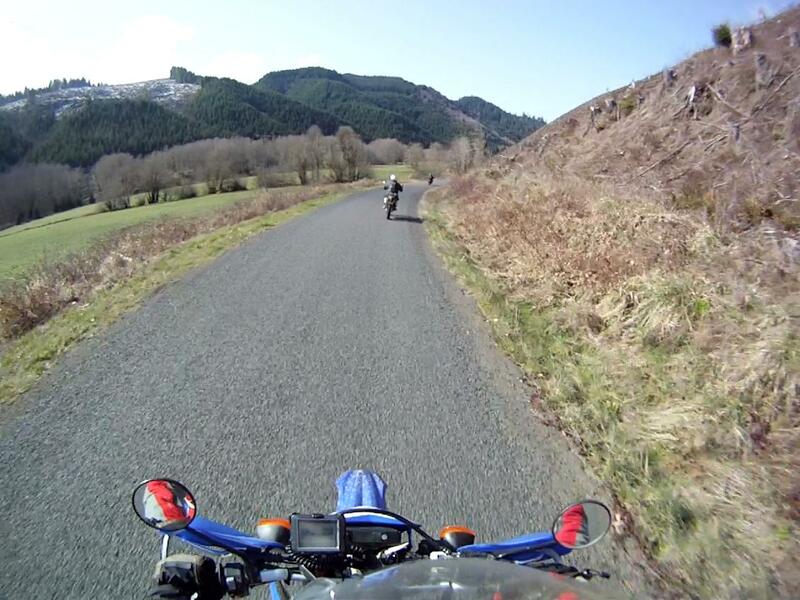 And what a ride it was, what a great way to start the new riding season! Before the weekend I had checked the weather forecast and those wise people had indicated a dry weekend, and Sunday temperatures would get to the 60’s. 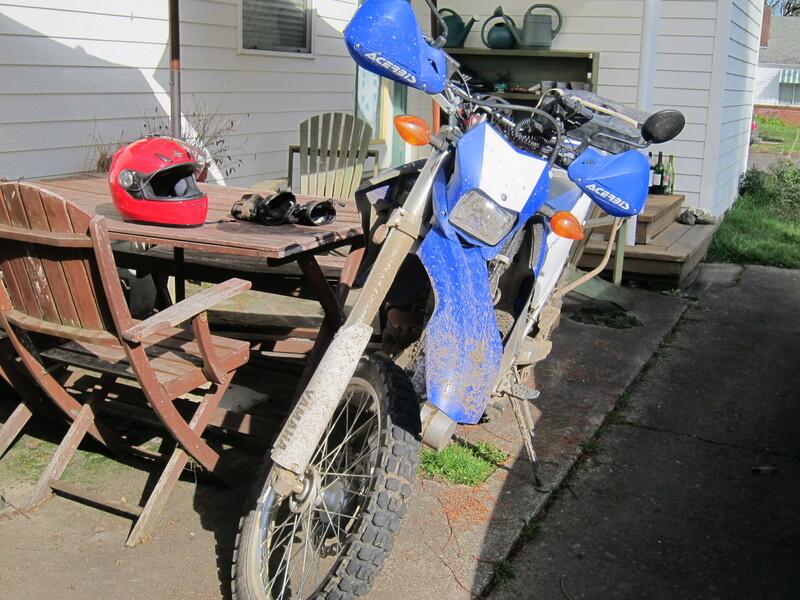 My plan for the weekend included soccer Saturday, the Carnaval party in the evening, and Sunday I would wash the Triumph (still had the mud from the last ride of 2011 in December) then take it for a spin, come back home, take care of the yard, then barbecue. Are you up for a ride? Doug asked. Huh… yes? I replied, with a lot of uncertainty in my own mind. Dirt. Riley wants to explore the Prairie Mt area. OK, I will get the Yamaha ready. Oh well, a decision had been made. I completely forgot about all the other plans I was debating with myself. The Triumph would stay behind. I got into action mode, had less than two hours to dig the Yamaha from the back of the garage, check fluids, air up the tires, find my riding gear that was all scattered and put away since last year’s last ride, fill up the bike’s tank and the auxiliary tank, charge camera batteries, find SD cards that had space for video. And oh yes, have some breakfast and be ready. Doug is very punctual. On a couple of occasions he has left for a ride without me because I was, uh, slightly late. Like 30 minutes late is too much for him. He would go crazy in Brazil, I can only imagine. But I digress. I got it all ready as the clock turned to 10:15am and Doug, as expected, showed up on the dot. 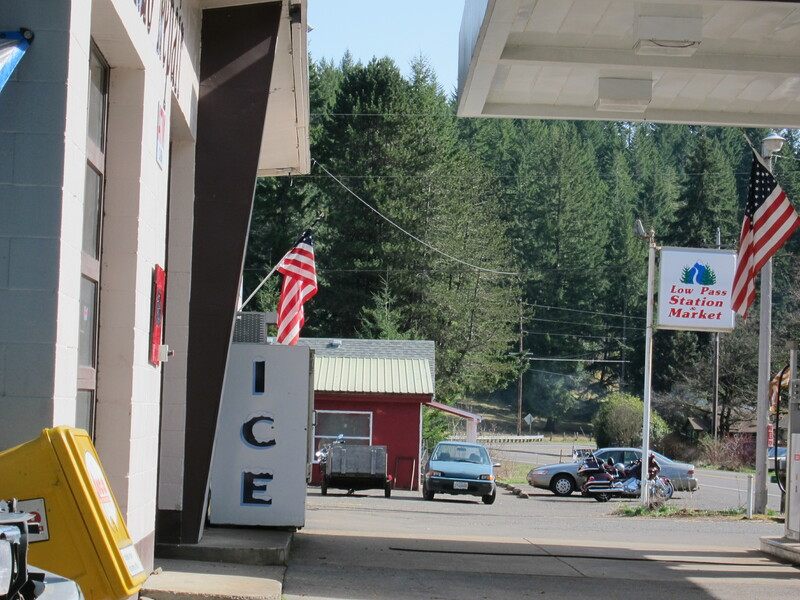 The plan was to meet Riley at the Chevron in Junction City at 11:00am. We had plenty of time to get there from my house. 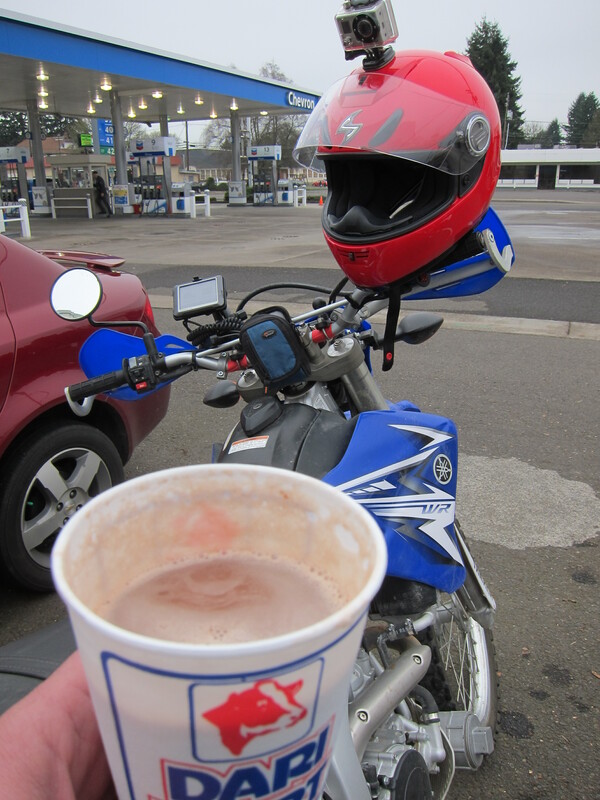 We arrived early enough that I had time to cross the street and get some Hot Cocoa at the Dari Mart. Good to warm up my hands. Doug had been talking to me about his recent rides with Riley. They already have a couple of rides on their belt this year. I had heard about Riley before, he is a local legend. 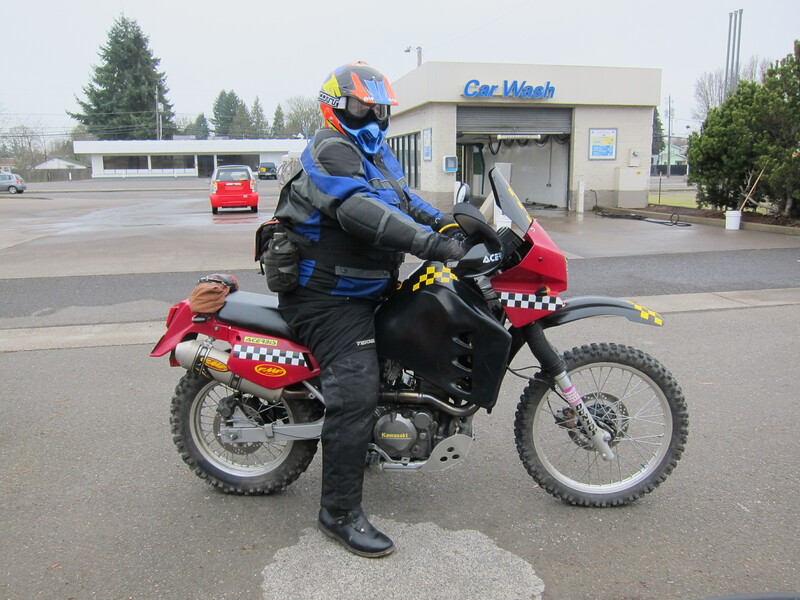 Among the many aspects about Riley and his involvement with motorcycles, what I know first hand started when I arrived in Eugene and I met him as the chief mechanic at the local BMW dealer, where I bought my BMW Dakar in 2006. Then he retired from that job and now I hear he works almost exclusively as a consultant or mechanic for old school BMWs. Riley arrived in time to fill his bike’s tank and be ready to ride at 11:00am sharp. 2011 seemed like the year where the entire staff at the local BMW dealer has changed over, compared to the time I first met them in 2006. The former crew always talked fondly and respectfully about Riley, specially about his knowledge of the old BMWs and about his dirt riding ability. He doesn’t walk very well, they would say, but once he starts riding, get out of the way. 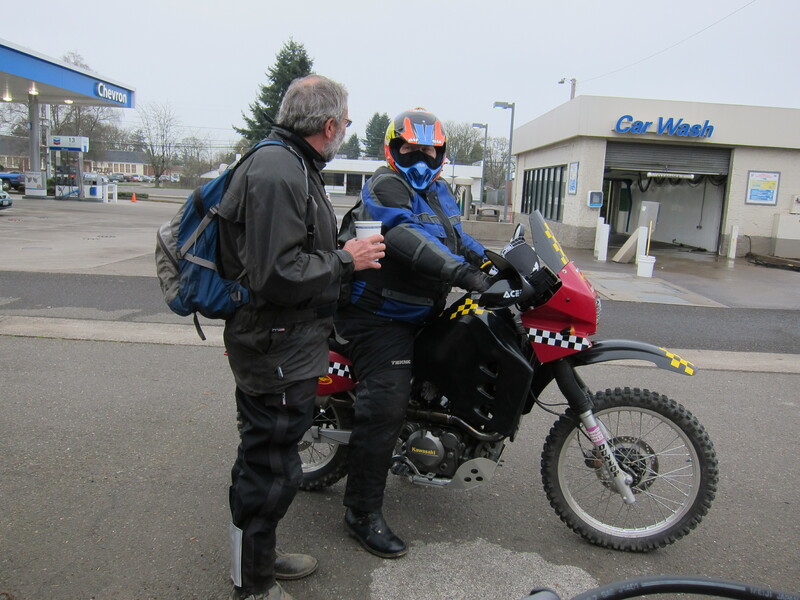 I was looking forward to this ride, for the opportunity to ride with a local, if not statewide (or even beyond) legend. 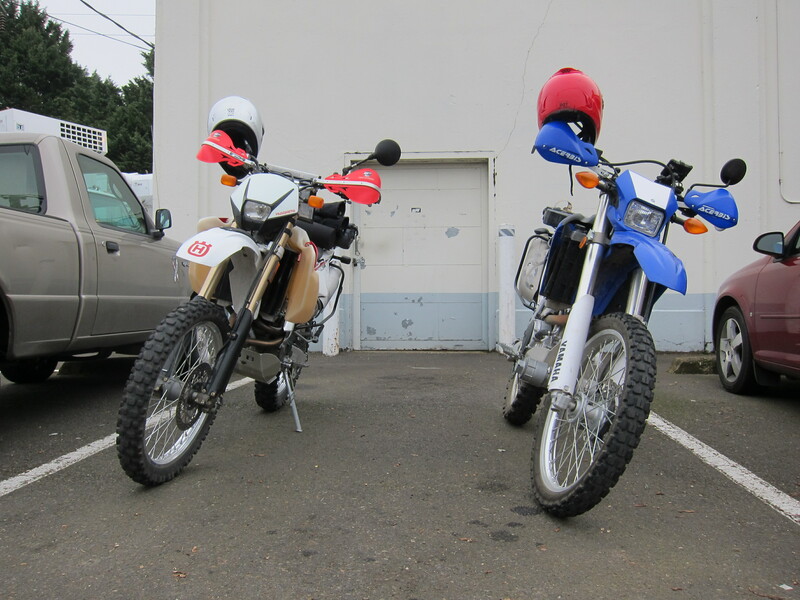 His motorcycle is not a regular KLR. He has done more modifications to it than I would know how to start explaining. The most obvious ones you can see right away. Tank, header and exhaust. But he has worked in its motor as well. In other words, don’t be fooled by his appearance or his bike. He is not only an experienced but he is also a fast dirt rider. Doug gladly accepted it. And I did not even think it would be any different. Usually I don’t mind following, especially following guys who ride faster than me. That’s the way it should be, in my mind. I’m happy to hang back and not worry about where to go next. Riley reported the plan: we would try High Pass road and come down to 36 from there. 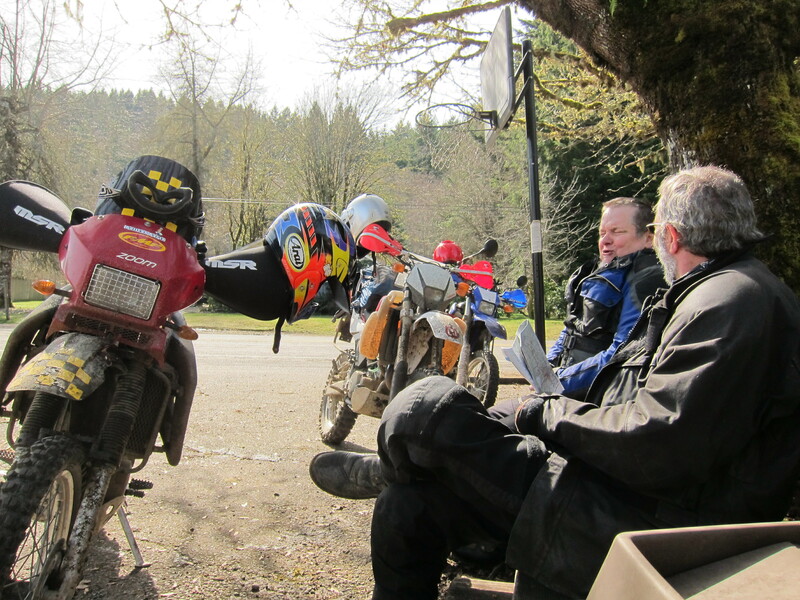 I was happy to just be riding but if my opinion counted I would say that was a great plan. The last time I had taken the Yamaha for a spin, last September, that’s exactly where I had taken it to and I had to turn around because of road closures (not snow related). What’s the range on that thing? With the auxiliary tank, 180 miles, I replied. Although, in reality, I knew with the type of riding we were going to do, it would be more like 150 miles, being optimistic and all. But I did not want him to worry about it. I had a feeling we would not be going too far. 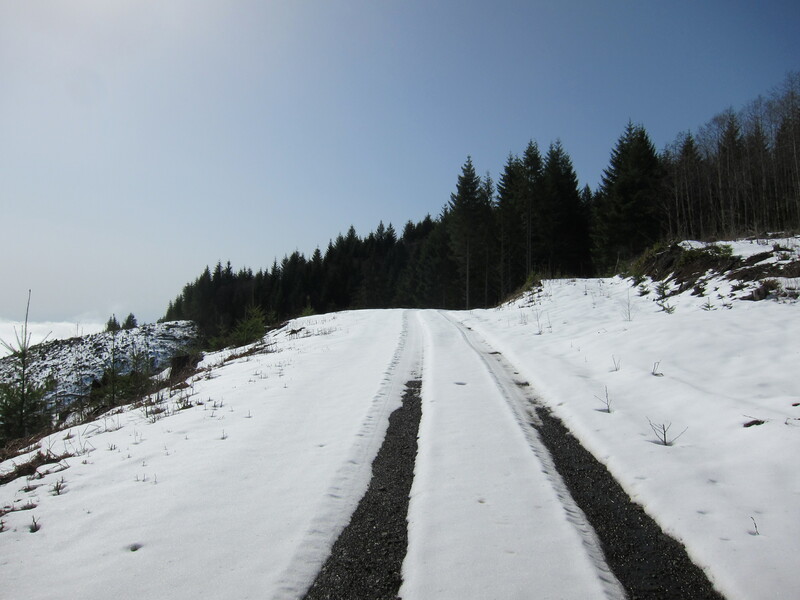 The thought of snow on the planned route came to my mind, but I said nothing. From my office I can see a few hills on the northeast side of town and I could clearly see new fresh snow down to the 1,500ft level this last week. If not lower. But hey, this is an adventure and I’m not riding alone, so let’s make it more interesting. The weather forecast had mentioned the sun would be out at some point. But as we set off, the clouds were hanging low above us. Let’s get going, lets go above the clouds, Riley proclaimed. And we were off. 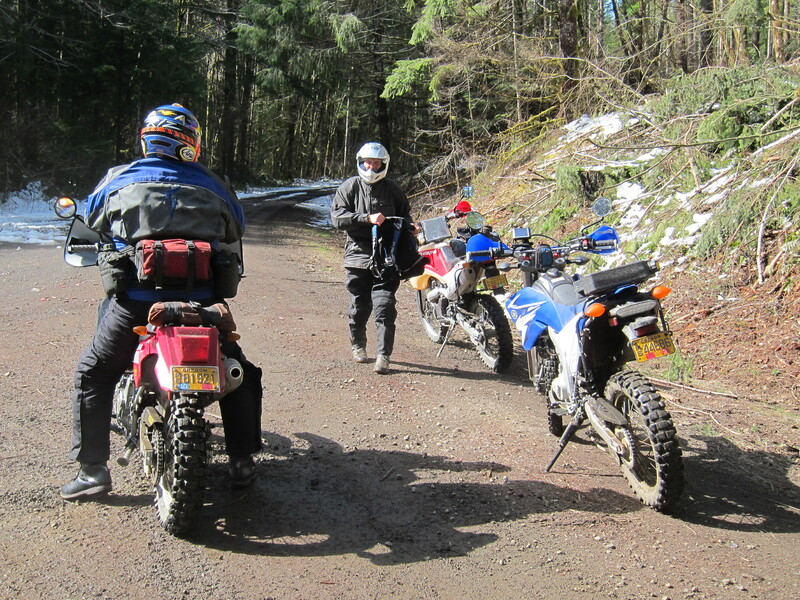 The riding order was Riley, Doug, and then me, which remained to the end of the ride when we arrived at the Low Pass Rd (Hwy. 36). There was no dust so we were riding close enough from each other that I kept visual contact with Riley and could follow his signals. Like when he pointed out the road sign that read “end of pavement” so we would get ready for the action. Once we hit dirt, we soon started climbing and were at the cloud level in no time. Or in the fog. I was having a blast, these guys were riding at a good clip, as you can see from this video. 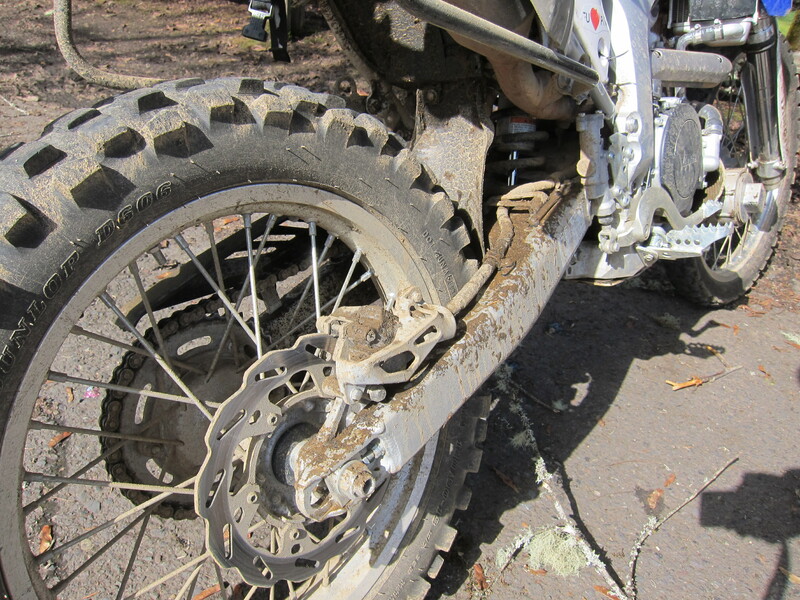 The road conditions were OK. Not dry, but the mud was not deep, and most of the wet areas had enough gravel to maintain good traction. But I could see snow accumulated here and there on the sides of the road. 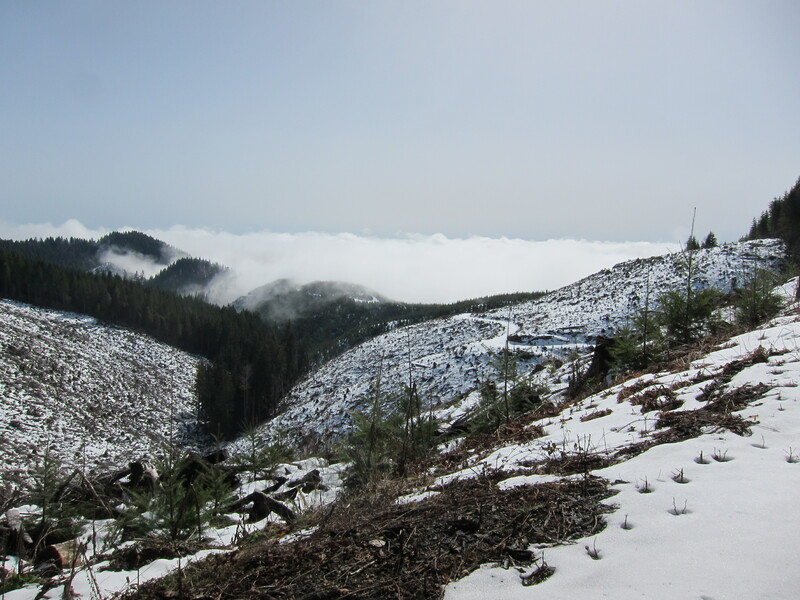 We were getting close to the snow level, as you can see at the end of this 3 minute video. 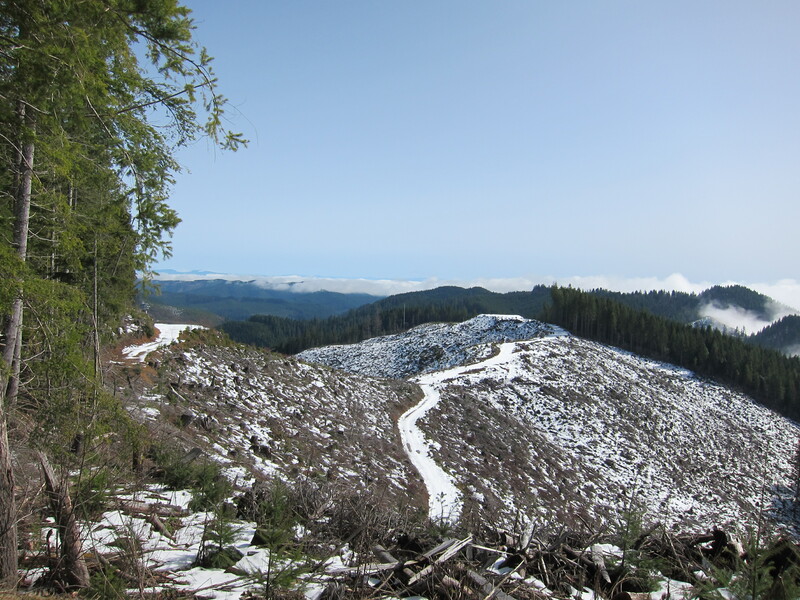 We continued climbing a few more miles and soon we were at the snow level. 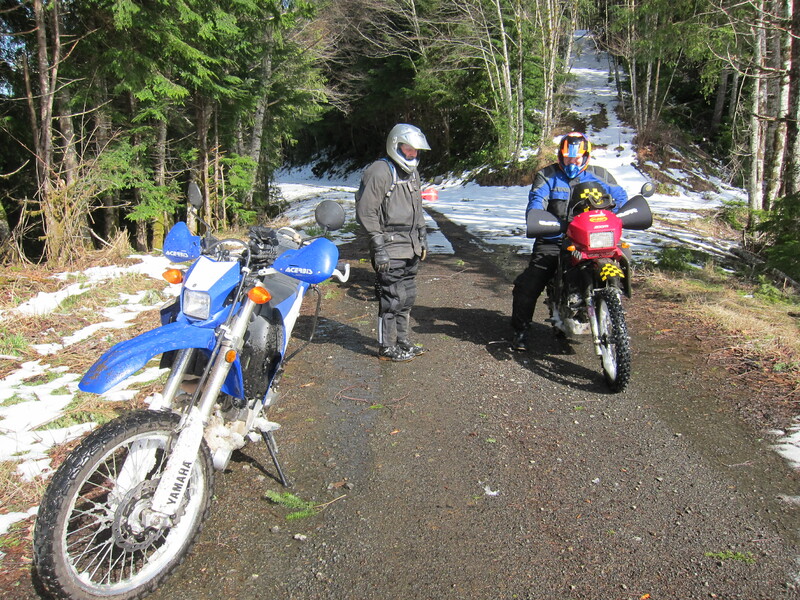 The roads were still rideable, and it was still fun to ride as this short video demonstrates. But it was obvious this would change if we kept going up the mountain. Soon enough Riley stopped. The planning committee got together and Riley gave us a new direction. Someone had been there before us and spent enough time at this juncture to build a snow man (see on the lower left on the picture below). That road going up on the snow was the direction we had planned to go, by the way. 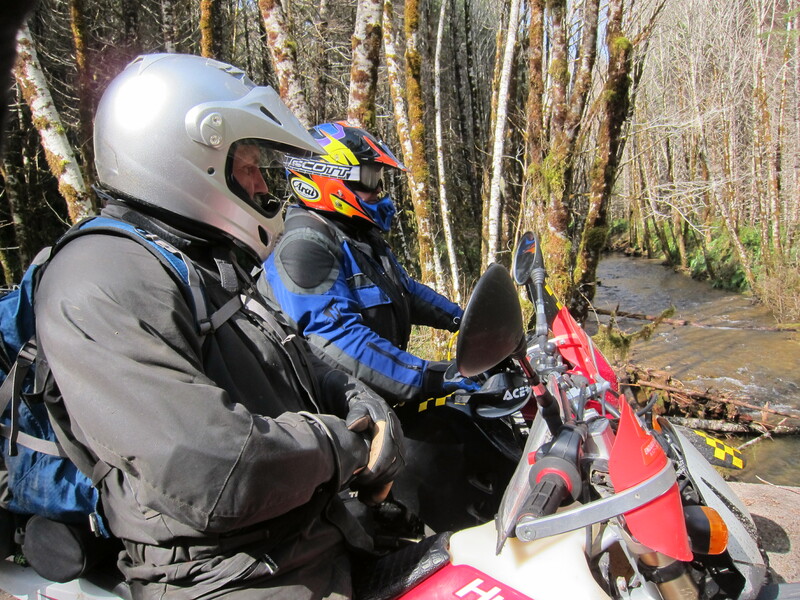 The new plan was to go down past the Hult Pond, get on Lake Creek rd and find our way to the Prairie Mountain Range road (at least that’s what I understood from their conversation). 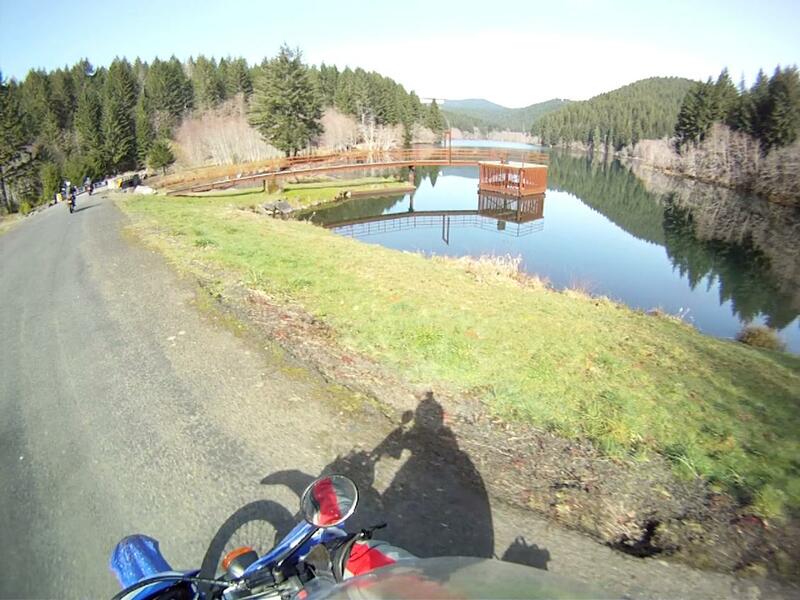 Here is Hult Pond, picture taken by the GoPro camera. Rather nice looking in such a windless day. 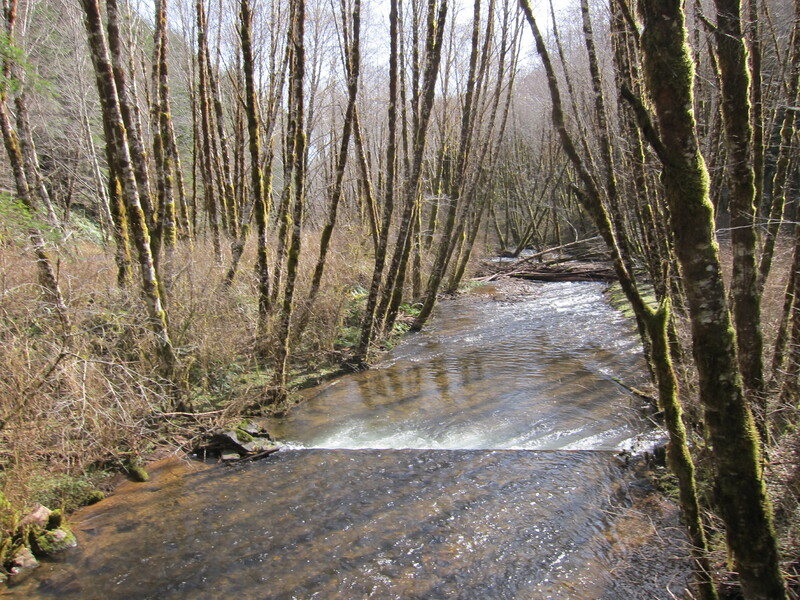 And here is the pond’s dam, with a fish ladder. Soon we were in a nice valley. I think this is Lake Creek Rd. I’m not completely sure about where we were. Soon enough we were climbing again. Once again, it is a blast to ride with these guys. They move fast. But soon we started seeing snow again. And then we got to this. Riley finally stopped when we hit a patch of road without snow and another meeting took place. 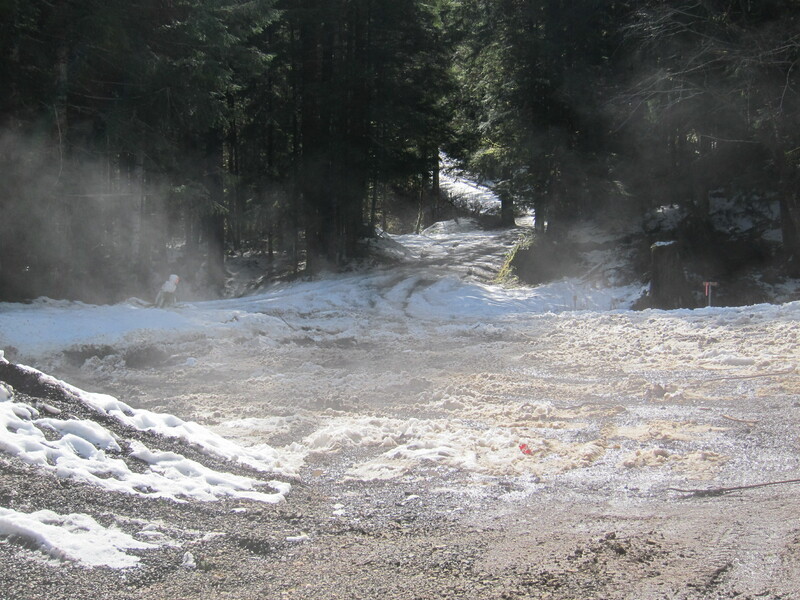 This is what the road looked liked from there. We tried to continue a bit further, but it became obvious that it was not a good idea. There would be two more miles of this. I have to say I was having plenty of fun on this ride. Why spoil it with yet more fun? The views were great from there. We had made it to above the clouds. 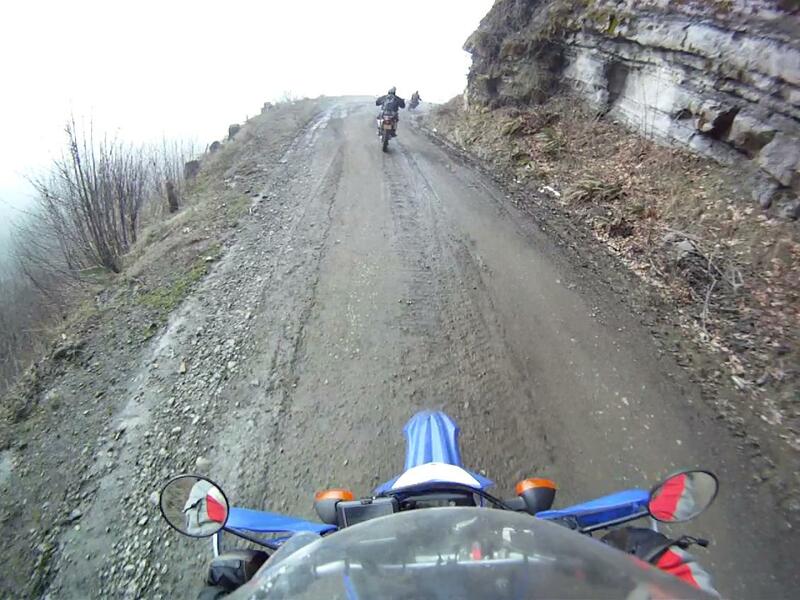 We turned the bikes around and initiated our descent. We tried a few other routes before completely giving up on the ride. A final meeting and we were done. We made it to Low Pass. By the way, Low Pass and High Pass were two roads that connected Junction City and Eugene to the coast. Low Pass is mostly Hwy 36 today. That’s before Hwy 126 existed. Once there, the story telling and bench racing started. It was great to have had a chance to ride with Riley. It is always a pleasure to ride with Doug. There was mention of future rides, so I won’t be surprised to get another call from Doug in the near future about plans to go on rides with Riley. The Yamaha had its share of abuse. But it can take it. We said our good byes and I took Hwy 36, I mean Low Pass Rd, straight back to Northwest Expressway and in no time I was home. 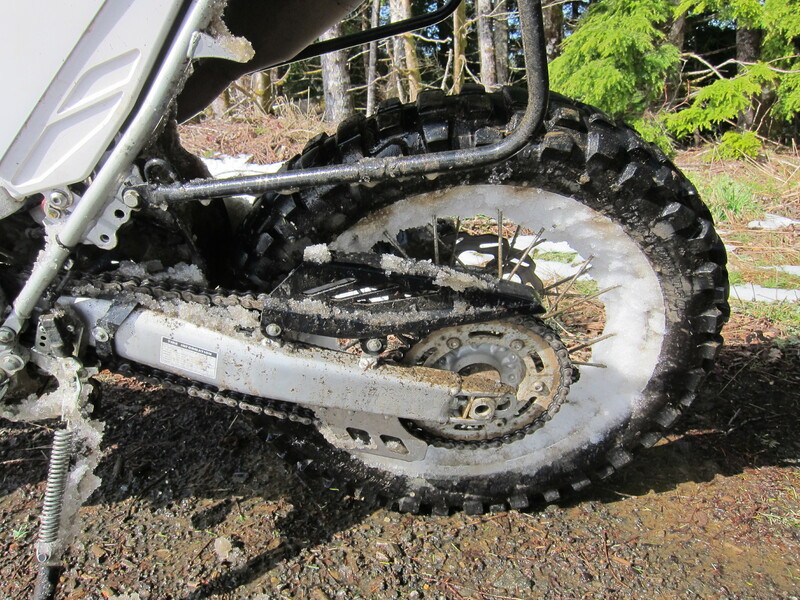 All in all a memorable first ride of the season. It could not be much better than this. 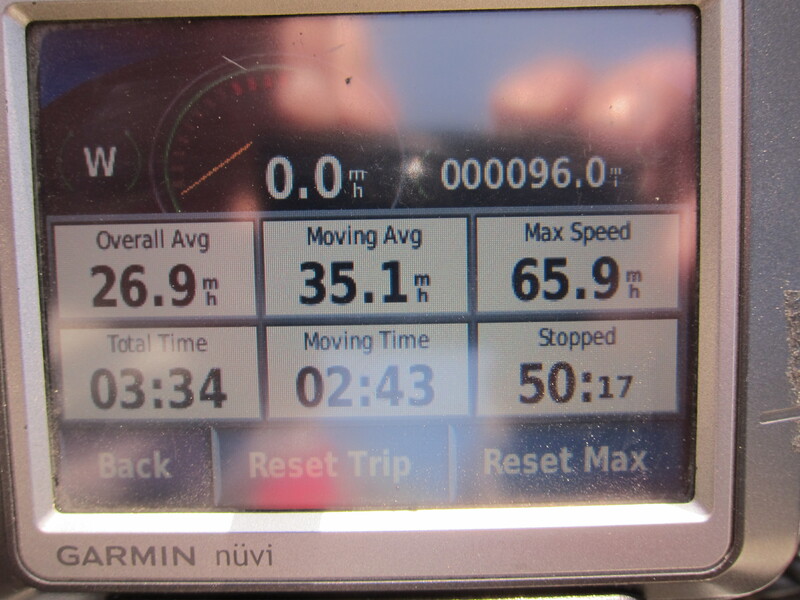 It was 96 miles (155 km) in good company, on great roads, at a nice pace, and with just enough challenges to make it special. That’s it. Now, what’s next? 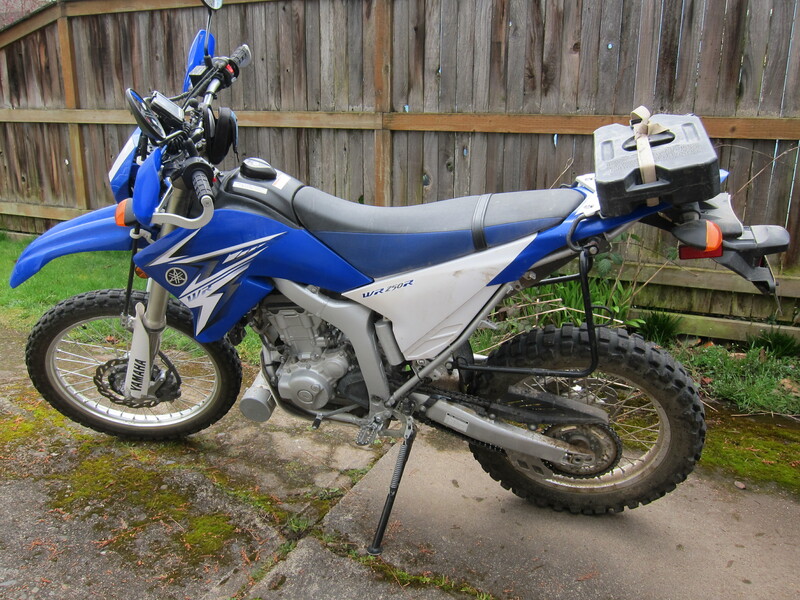 This entry was posted in Riding the Yamaha and tagged Gravel and snow riding, motorcycle, motorcycles, oregon, Prairie Mountain, WR250R, Yamaha. Bookmark the permalink.